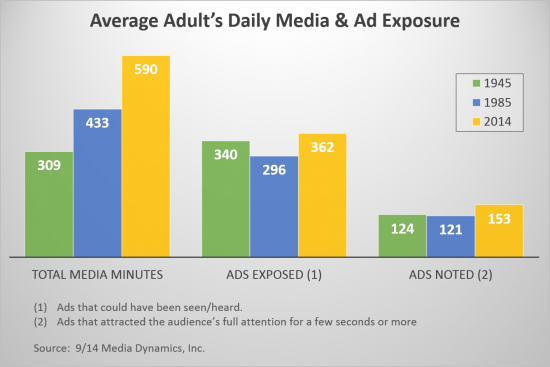 A new study of media usage and ad exposure by Media Dynamics, Inc. reveals that while a typical adult’s daily media consumption has grown from 5.2 hours in 1945 to 9.8 hours (or 590 minutes) currently, this has not been reflected in a huge spike in ad exposure. Although commercial clutter on TV has risen steadily, today’s viewer has more avoidance options like remote controls and DVRs, and many more channels to choose from. As a result, the study summarizes the number of ads that adults are now exposed to across all five media (TV, radio, Internet, newspapers and magazines) is about 360 per day; of these, only 150-155 are even noted, and far fewer make a strong enough impact to be recalled, make an impression, and ultimately, make a sale. The chart below reflects MDI’s projections of the average adult’s daily media usage for 1945, 1985 and 2014. It shows the huge increase in total time spent, but the relative stability in terms of ad exposure and noting. This is a solid indication that time spent with the various media of course is not an indicator of ad impact. This study begs the question and somewhat challenges the prior Yankelovich estimates that a person 30 years ago saw up to 2,000 ad messages a day, compared with up to 5,000 or more exposures today. So just how many marketing messages do we see in a day? In addition to the Yankelovich study (later quoted by the NY Times), depending on what’s included, other studies support that message and brand “exposure” can range from 3,000 to 20,000. Those higher numbers not only include ads, but also include every time you pass by a label in a grocery store, all the ads in your mailbox whether you see them or not, the label on everything you wear, the condiments in your fringe, the cars on the highway, etc. The fact that you and the message or a brand name or logo are in the same proximity for you to see it doesn’t mean you saw it. No one can really process that many exposures. We can’t notice, absorb, or even judge the personal merit of 3,000 visual/audio exposures per day, let alone 20,000. Bottom-line, increasing engagement will help advertising break through the clutter of not only the hundreds of ad exposures per day, but of the thousands of ad and brand exposures per day.